Sound familiar? Many doctors, even dermatologists, simply don’t believe topical steroid withdrawal causes rebound flares. The overarching belief is that symptoms are due to eczema. If there’s a flare, keep applying steroids and if it doesn’t get any better, use a stronger one to keep it under control! One reason doctors deny the existence of TSW is because they have no drugs available to counteract withdrawal symptoms. They have no choice therefore but to recommend ‘cold turkey’. I have one word of advice if you are anticipating or already using this method. “DON’T”. There’s a better way. It may be the most popular method advocated by doctors, but unfortunately it invariably results in severe suffering for the patient. It can be extremely difficult to tolerate withdrawal symptoms that can take more than 4 years to overcome – and even then one can be left with permanent skin damage. Topical steroids (TS), were first used for treating eczema in 1951 apparently “revolutionising” its treatment. Unfortunately, like many new ‘miracle’ drug treatments, it was soon realised that prolonged use atrophied the skin and caused various other adverse side effects. Today there are an estimated 250 million TSW sufferers worldwide. Even after a few days of TS use, microscopic damage to the skin can be detected. After prolonged use though, macroscopic damage occurs and is often irreversible. There are many other potential adverse effects from long-term use. Also, the immune competence of the skin, which protects our bodies from external invaders, becomes compromised. Eventually rebound symptoms come to control the patient’s life while skin damage relentlessly continues. Increasingly stronger steroids and even anti-cancer and immune-suppressant drugs such as Protopic (tacrolimus) and clobetasone (some 600 times “stronger” than hydrocortisone) are used. These unfortunate individuals are often referred to as “steroid-addicted”, but their rebound symptoms are no fault of their own. After all, doctors prescribed the drugs that created the situation. To be fair though, given the limited tools at their disposal i.e. modern pharmaceuticals, they had no other choice. In many cases the original problem, atopic eczema, spontaneously recovers, but the patient is left with TSW. Terms such as “topical steroid addiction”, “red skin syndrome” etc. are often used to describe this condition but are not believed by many doctors. Also, these terms describe symptoms, not the actual status of the skin. 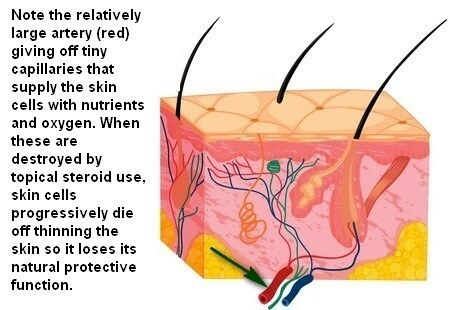 The skin is a highly complex organ; the body’s largest in fact. TS damage involves structural as well as functional deterioration. Even after a week or two of TS “treatment”, there is a reduction in the size of skin cells and the number of cell layers forming the skin. Reduction in cell division and growth leads to damage to the ‘microcirculation’ i.e. tiny blood vessels and nerves that control blood flow. This compromises oxygen and nutrient supply essential for growth, and skin cells are progressively destroyed. In fact, the potency or “strength” of TS is measured and categorised “scientifically” by their relative ability to constrict capillaries. Damage to the lymphatic system, one of the components vital for effective immunological protection further reduces the skin’s ability to protect itself (and subsequently, the body) from infection. Eventually, the skin becomes thin or atrophied, and inflamed. If continued, TS can cause irreversible damage and permanent atrophy. For example see how much damage they can do to finger nails after long term use (and how wheatgrass restored them to normal). WHY DOES MY SKIN BURN? Dr. Marvin Rapaport, a well known dermatologist in the US explains "red skin" and "burning" in this video which I strongly recommend to all sufferers of TSW and their carers. This is a game-changer in understanding withdrawal symptoms and is ideal for convincing doubting doctors and others. The “wheatgrass” I prescribe for my TSW patients is a potent extract derived from young wheatgrass sprouts. This is the stage of growth where maximum bioactivity has been detected in the plant. Wheatgrass and other cereal grasses have been the subject of extensive clinical and laboratory research since the 1930’s in the US and until the present day. Highly successful for treatment of burns, injuries, skin pathology including TSW and many other conditions, it appears wheatgrass is (a) an efficient anti-inflammatory, (b) a potent immune-modulator and (c) an activator of growth factors to start repairing damaged skin. These are all important features necessary for skin recovery and infection prevention. There is no one modern pharmaceutical that can achieve all these goals, and possibly none of them. HOW DOES WHEATGRASS HELP TSW? Being a potent anti-inflammatory and immune-modulator wheatgrass extract can help control rebound by stimulating new skin growth, reducing pain, burning and itching. It most likely achieves this by repairing the function of the tiny nerves that control the supply of blood to the skin, (see figure above) significantly aiding the healing process. Wheatgrass has successfully helped many of my patients over the TSW hurdle. Damaged skin in time gradually reverts to normal in the majority of cases if you persevere. However, this is not a ‘quick fix’. It takes time – around 6 months – but even so-called “irreversible damage” can be overcome eventually. By comparison, because the skin structure and function has not been restored, ‘cold turkey’ patients are often left with permanent atrophy and associated skin dysfunction. To begin with, combine every daily topical steroid application with wheatgrass Skin Recovery Spray (or wheatgrass juice, which can still be effective, but is not as potent.) The aim is to reduce TS by gradually replacing each daily application with wheatgrass extract only until you are only using wheatgrass. The combination of TS plus WG helps reduce rebound inflammation concurrently aiding recovery of steroid-damaged skin. In the early stages it can be difficult to reduce even one application of TS, but if you persevere, you will eventually only need wheatgrass to keep your skin stable and continue recovery. Because itch is usually worst at night, eliminate that TS dose last. First reduce the morning and afternoon (or morning dose if you’re only applying TS twice daily). This process will take time and patience, 4 to 6 months perhaps - but it is important to persevere and to give the skin a chance to gradually recover while withdrawing from TS. Click on the TS Reduction Chart .pdf link below to print out your copy. If you are already established in ‘cold turkey’, you will still need to use daily wheatgrass to recover your skin's structure and function. It may therefore be necessary to return to using topical steroids for a month or so in combination with wheatgrass to help ease withdrawal symptoms. I suggest you start from Week 14 on the Reduction Chart, add a little TS once daily to the worst affected areas then work your way down the table. This is NOT a backward step. In fact if you follow the reduction chart and only use TS occasionally combined with WG, your withdrawal journey will almost certainly be shortened. Remember, the aim may be to rid yourself of TS, but you want to have normal skin at the end of the ordeal. So try to see this as a transitional phase. It’s okay to go backwards from time to time. After all, think how long you’ve suffered already - and how long you might have to go if you don't use wheatgrass. If possible, combine the topical with daily oral antioxidant-rich wheatgrass extract (e.g. Supershots, or wheatgrass juice). This helps repair and maintain a damaged immune system caused by topical and/or oral steroids. Also, there is evidence that wheatgrass may stimulate growth hormone production from the pituitary gland. Growth Hormone activates IGF-1 (insulin growth factor -1) and promotes tissue growth which is what you need to help your skin overcome TS damage. If necessary, grow your own wheatgrass, juice and drink it and apply it daily – and persevere. Too many people give up too soon, so allow at least six months to achieve significant improvement and/or recovery. Given nothing else appears to assist skin recovery, I can vouch for the fact it will be worth the effort. This process takes time. But TSW DOES take time. Mine is a methodical approach where gradual reduction can be readily observed and achieved. It is important to photograph your worst affected areas for comparison purposes before commencing this programme, bearing in mind, skin eruptions can occur anywhere and everywhere. Also, these eruptions are TSW symptoms - an adverse drug reaction, NOT eczema. Any kind of progress can be uplifting and encourage you to persevere. Clinical observation shows that the bioactives in wheatgrass are rapidly absorbed through the skin where they help to contain rebound. Exactly how this is achieved is not known, but wheatgrass is SAFE and can be applied as often as you like. However, I have not found that using it more frequently makes much difference to the rate of recovery. Finally, avoid soap. It saps your skin of the natural sebum that keeps your skin moist. Try to find a colloidal oatmeal-containing soap-free wash and shampoo. E.g. Aveeno (US), Dermaveen (Australia). Also, reduce hot water exposure, it dries your skin by removing sebum, the oily natural moisturiser essential for normal skin function. Take 5 minute showers and NO BATHS. Try to persevere with wheatgrass. See it as a friend helping you through your TSW ordeal. I just wanted to let you all know how much your product helped me get through my struggle through TSW. Anyway, after using the wheatgrass cream alongside weaning off the topical steroids it probably took me a total of 4-5 months to get to a point where my skin was functioning with nothing at all and the plus side was that during this time I was able to go about my life as normal compared to an agonising two or three years I could have faced if I continued cold turkey, so thank you!! Wheatgrass NZ Ltd, PO Box 9658, Newmarket, Auckland 1149.